Born in Harlingen, Texas and raised in Houston and San Antonio, Johnnie’s interest in art came at an early age, sparked by everything from PBS, Mark Kistler (Commander Mark) programs to the vivid illustrated side panels of arcade games. Johnnie’s love for movie art started with an obsession for the Ninja Turtles, his first piece of work was of the Ninja Turtle Movie poster. Two decades later his artwork demonstrates a refined ability to capture the depth of human experience from iconic movie scenes. Rosales’ art has been featured in over 400 conventions, art shows and art markets. 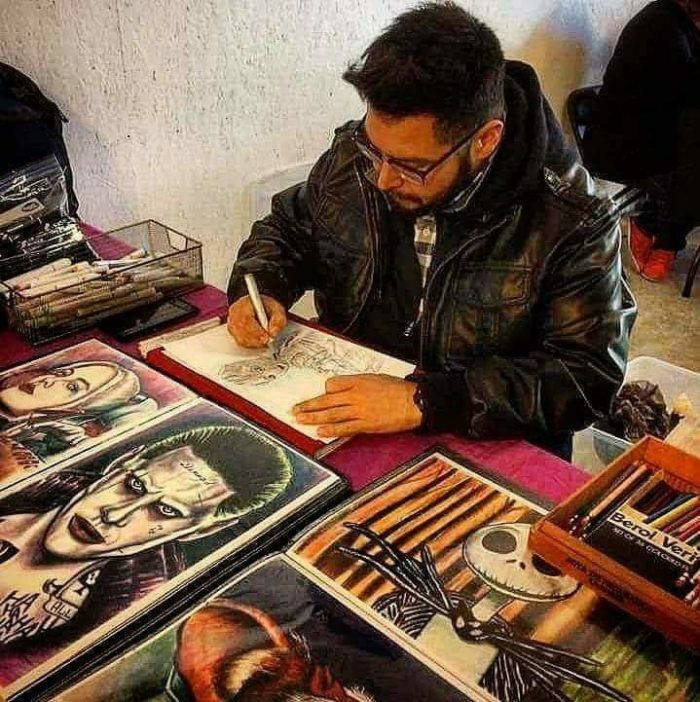 His artwork has sold in over 30 states and 7 countries and has been Featured in Houston Press, Fox News and was featured as the exclusive print for Stan Lee VIP Packages at Houston Comipalooza. His art has been collected by celebrities such as the entire cast of Sons of Anarchy, Fox’s Gotham, including Robin Taylor, Donal Logue, Sean Pertwee, Camren Bicondova, AMC’s The Walking Dead Cast, including Andrew Lincoln, Chandler Ricks, Steven Yeun and Danai Gurira. The cast of the 1987 classic, La Bamba, Lou Diamond Phillips and Esai Morales are also fans of Rosales’ work. Other notable collectors are Tom Berringer from Sniper (1993), Michael Biehn from Tombstone (1993) and Danny Trejo from Desperado (1995). Even PBS’s Mark Kistler aka ‘Commander Mark’ is a collector of Rosales’ work. Johnnie’s heart is his family, His mother Nora, father Johnnie Sr, brother Jacob and sister Gwen give him his greatest inspiration and support. In his free time, Johnnie is active Houston’s art community, supporting fellow artists and mentoring up-and-coming young artists.